Northern Chemical Co., is a family-owned janitorial supply and service company that was established over forty years ago in Glendale Arizona. We have built our reputation as a home-grown company based on integrity, superior service and equipment and chemical knowledge that is second to none. 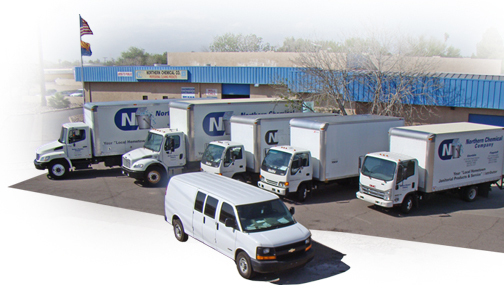 So whether you are looking to spruce up your establishment or maintain a clean sanitary environment look no further than the experts at Northern Chemical Co.
With multiple locations in the state of Arizona (which include a distribution center in Glendale and Flagstaff and a sales office in Tucson), Northern Chemical can serve all of your cleaning needs. With an extensive back ground in contract cleaning in retail and tenant occupied buildings, Northern Chemical has both the knowledge, chemicals and equipment you need to keep your facilities sparkling-clean. Spartan Chemical Company, along with Prolink, provides Northern Chemical with the best possible cleaning chemicals for retail, commercial, industrial and residential cleaning and maintaining. So whether it is floor care, carpet care or just chemicals for cleaning your restroom at home we have you covered. If it's equipment that you need we have that covered as well. With a full-service center located in Glendale, AZ and service technicians on the road we can handle all of your repair needs. We have the support of five (5) national equipment lines; if new equipment is what you are looking for, we are the place for you. We stock everything from an upright vacuum cleaner to a ride-on automatic scrubber (and everything in-between). Recently, we were awarded a contract with Mohave Educational Services Cooperative, which provides purchasing services for Arizona schools, government and qualifying non-profit organizations. We look forward to working with both Mohave and its members to provide a clean and sanitary environment for both the children and employees of our great state. WE ARE HERE TO SERVE ALL OF YOUR NEEDS AND KEEP ALL ARIZONA DOLLARS IN ARIZONA.